We really are in the middle of quite the slump. This team looks completely different from the one that had the best record in the Majors. Our record is now 22-16; if we continue at our current rate, we’ll have to start winning just to stay at .500, and we all remember what that feels like. We got swept by the Rangers; at least, at the time, we felt like the Rangers were a good match. But Minnesota’s pitching staff has one of the lowest strikeout counts in the Majors, and Toronto’s pitchers are mediocre at best and their hitters swing at almost anything. We are losing games we should not be losing. Not that there’s ever a game that we should lose, but still. Speaking of the Jays specifically, it would have been very nice to escape the series without allowing them to hit a slew of home runs. Sure, we hadn’t been able to win by doing that, but at least we, for the most part, eliminated their chief mode of attack. Dempster was not so fortunate. He didn’t keep the ball down. His heat is more lukewarm than anything else, so you can see why location would have been the key to a successful performance on his part. He lasted only five innings and gave up six runs on seven hits while walking one and striking out three. And he allowed three home runs. It started in the second. He gave up a single, a double, and a three-run home run with two out. He gave up a solo shot to lead off the third, and he issued a walk and then allowed a two-run home run in the fourth. It would have been worse had Victorino gotten hurt trying to haul the ball in for an out. He tried to catch it right at the bullpen fence but fell flat-out; he left the game in the seventh with some stiffness. Dempster gave up another solo shot in the fifth. On a splitter. If Dempster is anything, he’s a splitter pitcher, so the fact that he missed his spot with a splitter says something. Dempster, overall, has been pitching very well, at least for him. But, yes, all of his runs scored via the long ball, which is exactly how the Jays like it. Miller came on for the sixth and gave up a solo shot on his third pitch. After recording the inning’s first out, he gave up a single, issued a walk, and was replaced by Mortensen. Mortensen gave up a successful sac fly followed by a two-run home run. He had a one-two-three seventh, and Breslow had a one-two-three eighth, making him our only pitcher to not allow any runs in the game. Jose De La Torre came in for the ninth and gave up a double, a walk, an RBI single, and an RBI double play. All in all, that’s twelve runs. By the time we got on the board in the fourth, we were already down by five. Napoli answered the Jays’ power with his own, smashing a solo shot on the second pitch of his leadoff at-bat in the fourth. And he hit it to one of the deepest parts of the park. It was a nice piece of hitting; if only such a phenomenon were more common for us. We didn’t score again until the sixth, when Pedroia singled and scored on a sac fly by Nava. We went down in order in the seventh, and then Ciriaco hit a home run. It was also a solo shot, and he also led off an inning. It was the second pitch of his at-bat, also a fastball. But he hit his beyond the Monster. Either way, it was still also a nice piece of hitting that we also could have used more of. Then Pedroia flied out, and Napoli singled, Nava walked, and Gomes got hit. Just like that, the bases were loaded. It was Salty’s turn to bat, but a force out was all he could muster; Napoli scored our last run of the game. 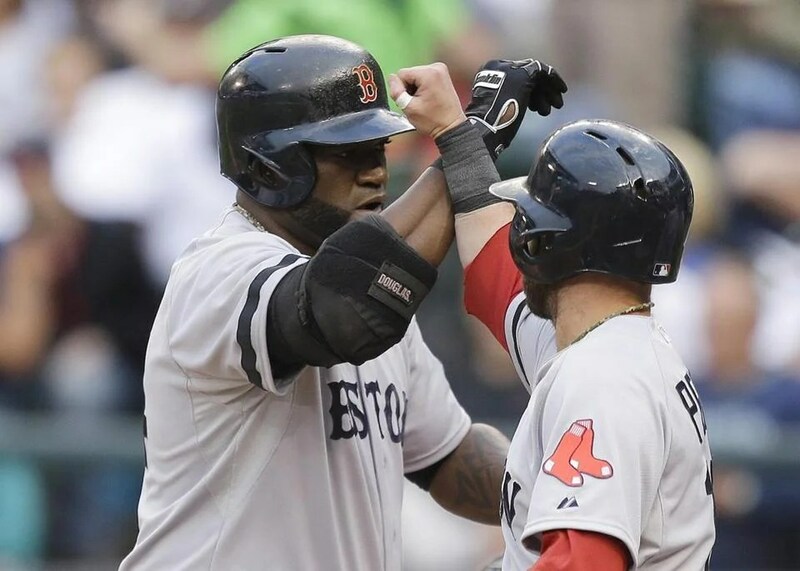 Napoli went three for four; the only other person to have a multi-hit game was Pedroia, who went two for five. Napoli alone scored half of our runs. So the Jays finally got what they wanted: a win via the long ball. Dempster, a single pitcher, accounted for half the runs they scored, while the relief corps divided the other half among themselves. The final score was 12-4; we scored less than half the number of runs that Toronto scored. We left eight on base and were 0 for 8 with runners in scoring position, so our dismal streak of being completely ineffective in situations when we need effectiveness most continues. Dempster took the loss, but it was a team effort. In other news, the Bruins got shut out by the Leafs, two-zip. So it all comes down to tonight. You know, it actually got to the point where I kind of forgot what it felt like. I forgot what it felt like to be completely shut down by another team over the course of multiple games played on multiple days. It’s like when we all forgot what sweeping other teams felt like when we were mired in the abysmal dross that was last season. Now I remember. Getting swept is not fun. This time, it was Lester who didn’t deliver. Actually, to be fair, he did deliver. He gave a quality start. He gave up three runs on five hits over six innings. He walked three and struck out seven; needless to say, his cut fastball wasn’t as formidable as usual. It didn’t have the same nasty bite on it that it usually does when he’s really on. He had a spectacular first and second during which he sent the Rangers down in order. Even his third inning, during which he gave up a solo shot, was otherwise great. He made a mistake on a cutter, and the batter figured it out, but other than that, he was spotless. He gave up a double and a walk in the fourth. He gave up a walk and a single in the fifth. And he gave up a single and a home run in the sixth, this one on a sinker. So as you can see, it became increasingly laborious for him as the game went on. He ended up throwing 115 pitches, seventy of which were strikes. It was just one of those days. His starts usually comprise less than three walks, less than six hits, less than three runs, more than seven strikeouts, and more than six innings. Not yesterday. Lester’s ERA is now 3.30. But seriously, it wasn’t that bad. It wasn’t even bad at all. Lester gave up three runs. If that had been the extent of the damage that the Rangers had been able to inflict, then the game could have potentially had a very different outcome. Even if the Rangers scored more, the game still could have had a different outcome if we had been able to score more than we did. By the time the Rangers scored their first run in the third, we were already up by three. So by all accounts, it seemed like we could have at least ended the series with the dignity of not having been swept right out of Arlington. With two out, Pedroia singled, and Papi unleashed on a 3-1 fastball. The ball ended up beyond the right field fence, and we ended up with two runs just like that. His hitting streak is now at twenty-five. In the very next frame, after Carp struck out, Ross hit his second pitch of the game for a solo shot. Both pitches were sliders around the same speed. He took the first one for a ball; he sent the second one beyond the left field foul pole. It was awesome. You had the veteran slugger slugging, and you had the comebacker slugging as well. Better still, you had the comebacker becoming the fourth player in the history of Rangers Ballpark to smash one into the club tier. Things had looked good. After we went down in order in the third and the Rangers scored their first run, things still looked good. Neither team scored in the fourth or fifth. We went down in order in the top of the sixth; for the most part, the two pitchers were involved in a duel of sorts. Both ended up giving up three runs; Lester’s two-run home run tied the game at three. And that’s the way it stayed through the seventh, which Uehara pitched. It’s the way it stayed through the eighth, despite the fact that we walked twice and that it took the services of both Tazawa and Miller to get through the bottom of the frame. And that’s the way it stayed through the top of the ninth, when Ross walked, Drew singled, and one out quickly turned into three. But that is not the way it stayed through the bottom of the ninth. Mortensen came out and was all business. He struck out his first two batters and looked solid. Then he gave up a single and issued a wild pitch, which is something that can happen when a sinkerballer sinks too low. In and of itself, that wouldn’t have done anything to shake the tie. Mortensen then intentionally walked Lance Berkman. Still, the tie was intact. It was the single he gave up to Adrian Beltre of all people that did us in. He threw five straight sliders to Beltre; when he singled, the count was 1-2. The final score was 4-3. It was the first time we got swept this year, and we now have to share the best record in the Majors with the team that swept us. This is the first time this year that we lost the first two games of a series. We’ve never been able to play that well against the Rangers. We still have the best record in the Majors, but I don’t want to be in the position of dreading playing a particular team. We should have strong showings against everyone we face. We went down in order in the first. We had two on in the third with only one out but didn’t score. Salty doubled in the fourth, but we didn’t score. We went down in order in the fifth despite a walk by Drew thanks to a double play. We had two on with two out in the sixth but didn’t score. We had two runners in scoring position with two out in the seventh but didn’t score. Napoli got hit in the eighth, but we didn’t score. I assume that, by now, you’ve guessed the pattern. Papi led off the second with a double and scored on a single by Nava. That was our one and only offensive highlight. We were held to that one run and that one run only. That was it. Just the one run. It’s more than zero; at least we scored something and we weren’t shut out two games in a row. But that’s not that much of a silver lining, if you ask me. Lackey’s start, technically speaking, was not a quality start. It was a real grind. Especially if his very first pitch was any indication. It was hit for a solo shot. That’s an inauspicious beginning if I’ve ever seen one. He seemed to settle down, sending the Rangers down in order in the second and third. But he got himself into a jam in the fourth and couldn’t completely pitch around it. Thanks to a single and two walks, he had the bases loaded with two out. He gave up a single that plated two runs and put a runner on third, thanks to a throwing error by Middlebrooks. He gave up another walk, but fortunately the damage ended there. He gave up two singles in the fifth and one in the sixth. Unfortunately, our damage had already ended in the second. It was a classic case of insufficient run support. 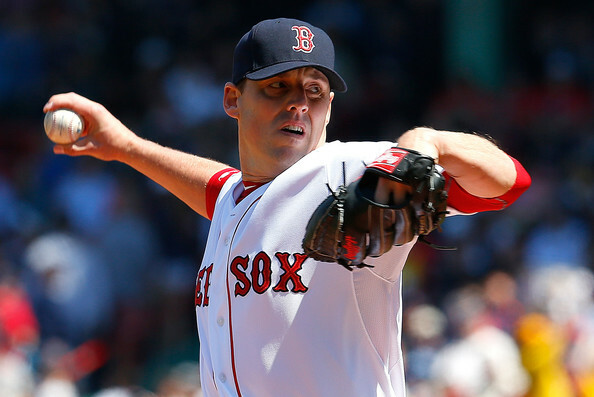 Lackey’s start was short, and those five innings were not shutout innings. However, we should have been able to score a sufficient amount of runs so as to bury the total of three that the Rangers had accumulated. Thus, Lackey was one inning short of a quality start. He gave up three runs on six hits while walking three and striking out four over the course of five innings, not the required six. Miller pitched the sixth, and Tazawa pitched the seventh with the help of three K’s. Uehara pitched the eighth and wasn’t so on. He got a strikeout to start the frame but then allowed a single followed by a home run. Big mistake. So instead of losing by 3-1, we lost by 5-1. In other news, the Bruins dropped one to the Leafs, 4-2. Let’s not deny it. When it became apparent that Lackey was returning to the DL, I bet that it initiated quite the storm of I-told-you-soing from those who were absolutely convinced that he would never return to what he once ways. As it turns out, we can’t yet say that he has. But we can say that his return from the DL was an unmitigated success. Commencing initial sighs of relief. He pitched six innings and gave up one run on five hits while walking two and striking out four. He threw only eighty-one pitches, fifty-six of which were strikes. The first inning was scary; after securing the first two outs, he gave up two consecutive walks and a single that scored the game’s first run. But he obviously settled right down after that. A single was his only blemish in the second, and his next three innings were one-two-three. He gave another big scare in the sixth by giving up three consecutive singles with one out but managed to escape the jam unscathed. Needless to say, I think that that was John’s cue to bring Mortensen, then Uehara, then Bailey for the next three frames, respectively. While the Astros were busy getting frustrated by Lackey, we were busy getting busy at the plate. Ellsbury grounded out to lead off the first but then Nava doubled and scored on a single by Papi. We were silent in the second and third, but we started the fourth with two back-to-back singles, both of which turned into runs on a triple by Drew. Nava reached on a fielding error to begin the fifth and scored on a double by Pedroia, who scored on a double by Carp two outs later. We went down in order in the sixth, and then Nava and Papi were at it again; Nava singled to lead off the seventh and scored on a double by Papi. All told, we walked twice and picked up eleven hits, five of which were for extra bases. Nava, Papi, and Carp all had multi-hit games. And though the Astros got seven hits by the time the game was over, they didn’t get the win. That went to us with a final score of 6-1. We are now eighteen and seven on the season, comparable to our incredible start in 2002. Ladies and gentlemen, we are the proud owners of the best record in all of Major League Baseball. Quite literally, it was an evening of milestones and breakout performances. It’s funny how there are players on our roster who we don’t really get to know as well as some others until that one big game when we remember how much of an asset they are. 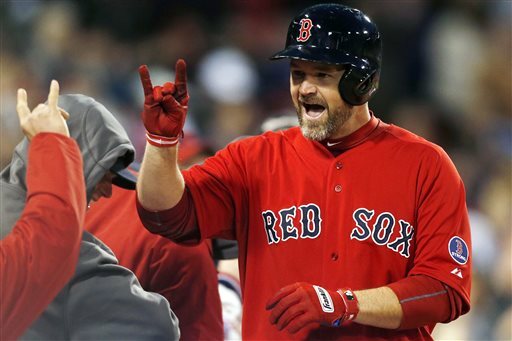 I would say that David Ross is such a player. We acquired him due to his awesome skills as a backup catcher. But offense-wise, there were probably many people who, around Spring Training, were thinking of him as just the other Ross. I’m pretty sure that that will no longer be a problem. We scored in each of the first five innings. Ellsbury hit a deflected single to open the first and scored on a double by Pedroia. With two out in the second, Ross went way deep. Like, beyond the Monster deep. Get-a-ninety-two-mile-per-hour-two-seam-and-crush-it deep. Put-us-on-top-by-two deep. 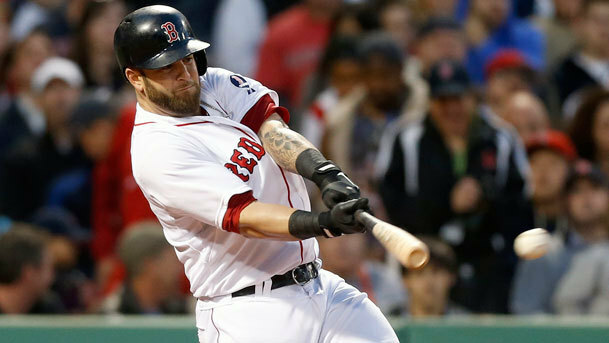 Pedroia doubled off the Monster and scored on a double by Napoli in the third. And then the fourth happened, and it was awesome. Middlebrooks and Ross smacked back-to-back jacks. Middlebrooks’s at-bat was a real battle. He took his first three pitches for balls, took the fourth for a strike, and then fouled off the others until he got one he liked. A lot. It was a changeup, and it found its way beyond the Monster in no time. And then Ross took two balls and gave a repeat performance. It was epic. You see something like that, and you do a complete double-take. Actually, in this particular instance, you do two double-takes. First you think you might be seeing a replay of Middlebrooks’s home run. Then you realize it’s Ross at the bat, so you think you might be seeing a replay of Ross’s earlier home run. And by the time he’s taking his own sweet time to round first, you realize that it’s the real deal and you just scored two runs on two swings. Pedroia grounded out to start off the fifth. And then Papi wanted in. On a 2-2 count, he got a four-seam clocked at ninety-four that was basically a straight shot to the plate. Big mistake. Yet again, he let the ball find the deepest part of the park. It was his second homer in as many days. This one just barely got out, but out is out. And even though we didn’t score in the sixth, it’s of course worth mentioning that Ellsbury stole his two hundredth base. That total puts him in heady Sox company; he’s the third since Harry Hooper and Tris Speaker did it, and he’s leading the Majors with eleven so far. And just in case we needed a little extra, we added some insurance in the eighth. Middlebrooks, Ross, and Ciriaco hit back-to-back-to-back singles to load the bases with nobody out. Unfortunately, Ellsbury lined into a double play, but Ross did score on a single by Gomes. Napoli has set two club records for this month, which by the way isn’t even over yet; his seventeen extra-base hits and twelve doubles are both monster stats for April. Ross was officially the man of the hour with the two homers as well as the first four-hit performance of his career. Dempster, who’s been an unfortunate stranger to run support until yesterday, held down the fort from the mound. Two runs on four hits while walking three and, taking a page from Buchholz’s book, striking out ten over six innings. He gave up a double to lead off the third, which turned into a run on a groundout. He gave up another double to lead off the fifth, which turned into a run on a sac fly, which itself could have been trouble had it not been for Gomes’s phenomenal diving catch in the classic Ellsbury style. Anyway, let’s talk about his K’s. There were the two swinging strikes in the first, one ending with a four-seam and the other ending with a slider. Then there were the two that began the second, both ending with sliders. There were the two in the fourth, one swinging on a splitter and the other looking on a four-seam. There was the one in the fifth, ending with a swing on a splitter. And last but not least, there were the two in the sixth, one swinging on a slider and the other looking on a slider and requiring all of three pitches. Mortensen came in for the seventh. He hit a batter and gave up a single made worse when Napoli missed a catch. He finally recorded the first out of the inning, but Tazawa came in after that. He gave up a sac fly that allowed one of his inherited runners to score. And then he gave up a single of his own before ending the inning. Uehara pitched the eighth, and Wilson pitched the ninth. The final score was 7-3. All in all, I’d say it went well.